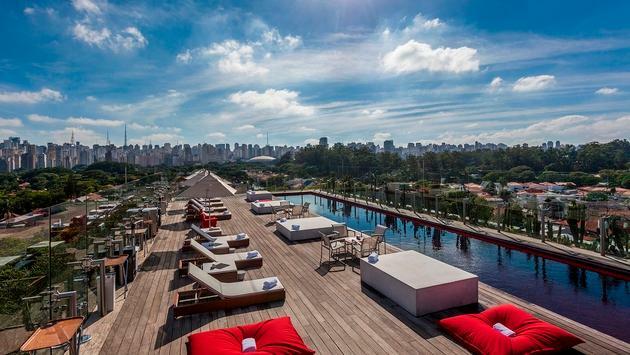 Hotel Unique's rooftop pool and bar feature a panoramic view of Sao Paulo. Sao Paulo is a vibrant, bustling city best known as the financial center of Brazil. With its impressive range of museums, galleries, architecture, upscale shopping, restaurants, bars and nightlife, it’s a cosmopolitan city that any urban adventurer will enjoy exploring. For an unparalleled stay in the city, chic travelers should check into Hotel Unique, a modernist architectural landmark with a distinct copper green, watermelon-shaped facade. Designed by Ruy Ohtake, this property is a work of art in and of itself, created with the intention of impressing guests from the moment they step inside. 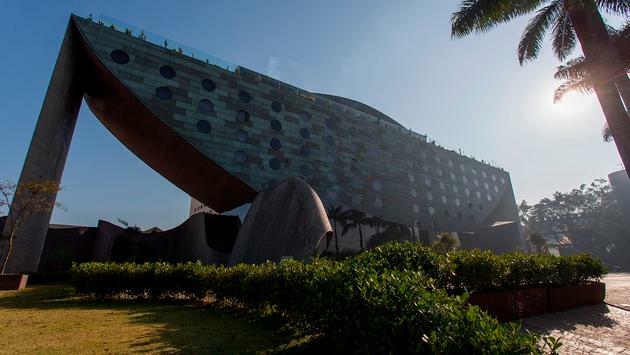 Hotel Unique's design is a one-of-a-kind watermelon shape. Hotel Unique’s sleek and spacious lobby interior boasts floor to ceiling windows and an impressive bar called The Wall Bar. In addition to serving up fancy cocktails and snacks, it’s adjacent to a library of over 300 titles that all cater to a crowd interested in art, design and architecture. Other special features include pitch black elevators that open at the scan of a card and lead to dark hallways lined with blue neon. Guests are also invited to book room experiences such as the romantic Dream Red experience, created with mood lighting, surprises and special amenities for a one-of-a-kind atmosphere. At the top of the hotel, guests will find the pool—which transforms into a blood red shade at night—and Skye Bar, which offers panoramic views of Ibirapuera Park and the entire skyline of Sao Paulo. It’s perfect for visitors looking for trendy, sophisticated vibes during a night out. Food also is a major reason to come here. Headed by Executive Chef Emmanuel Bassoleil, The Skye Restaurant offers a diverse menu that incorporates the flavors of Brazil, Japan, France, and Italy. The hotel is conveniently located in the heart of the Jardins neighborhood, an area known for its lush parks in addition to high-end shopping, upscale eateries and over 200 bars. This garden oasis is best explored on foot. Grab a cup of joe at Suplicy Cafe, whose founder’s zeal for coffee is unmatched, or stop by CAU Chocolates for some of the country’s finest handmade chocolates while you peruse designer shops. If arts and culture are more of what you’re looking for, head over to the Vila Madalena area which is home to countless art galleries and an incredible amount of vibrant street art. Filled with alleyways and intersections covered in bright, huge works of graffiti art, Beco de Batman is a section of the neighborhood you will not want to miss. 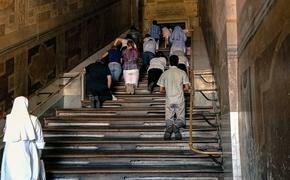 What started in the ’80s with one drawing of Batman is now a huge attraction for both tourists and locals alike. It’s one that is constantly in a state of flux with new art continuously replacing the old, with the artist’s permission, of course, making it something that never gets redundant. For the foodies, don’t miss out on the cheesy goodness that is hot, fresh pao de queijo. For the best cheese bread in town, swing by Haddock Lobo. Trust me, it’s worth the wait. Another must-experience is the Mercado Municipal Paulistano. This enormous bustling marketplace is filled with vendors selling everything from exotic fruits, vegetables, meats and fish to sweets, spices and traditional foods of Brazil. Though chaotic, it’s a culinary hub that’s well worth visiting if you’re a fan of traditional Brazilian food. You can’t go wrong with a giant savory pastel, a filled pocket of deep-fried dough that’s similar to an empanada, followed by a buttery, sweet Portuguese egg tart. Wash it all down with an authentic guarana soda. When you’re ready for a change in scenery, the Unique Garden Hotel and Spa is waiting for you just 35 miles outside of Sao Paulo. This property is unlike anywhere you’ll ever stay thanks to its touching history. The owner of Unique Garden, who also owns Hotel Unique, had one daughter who became blind at a very early age. This property was created initially as a sanctuary for his daughter and other blind children to experience all their other senses by being surrounded by nature. Today, Unique Garden has been reimagined as a place that emphasizes the importance of all six senses in their guests’ experiences on property. Touch, sight, smell, taste, hearing and the sixth sense, which they refer to as soul, are paid special attention to in ways guests won’t be expecting. For example, the property is home to a wildlife sanctuary that includes birds, Brazilian wolves, monkeys and more, in addition to a dog sanctuary. Guests have the option to adopt a dog for the length of their stay and can even adopt their new furry companion if it’s a match. The property is situated in the middle of lush forestry, surrounded by nature. Furthermore, this UNESCO-protected area is well known for having exceptionally clean air. Guests will be woken by the sounds of chirping birds and nourished throughout the day with true farm-to-table dining, ingredients of which come straight from the property’s culinary gardens. Guests are encouraged to relax, unwind and center themselves with spa treatments and therapies hailing from Chinese and Ayurvedic traditions, as well as European and American techniques. Other beneficial activities available include like planting trees, caring for animals in need of love and exercise through things like hiking, meditation and yoga.